ExperienceOver 60 years of combined experience in the aerial lift equipment industry. SatisfactionOver 1453 + satisfied equipment owners. Specializing in new Skyjack electric scissor lifts, boom lifts and telehandlers – reach forklifts at the very best value. 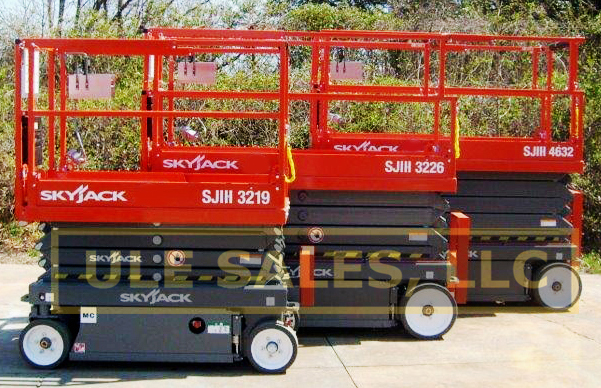 See our “new equipment” tab for Skyjack pricing. WE WILL REVIEW YOUR PURCHASE OPTIONS (NEW & USED) AND DELIVER AT THE LOWEST TOTAL COST POSSIBLE. If you are looking for the best-quality used or new aerial lift equipment at wholesale prices, you found us! We will work with you to determine your equipment needs. Scissor lifts: electric, gas and diesel with 16, 19, 20, 26, 32 and 40-foot platform heights available. Boom lifts: straight or articulating (z-boom) electric, gas, LP or diesel with 30, 34, 40, 45, 60, 65, 80, 85, 120, and 125-foot platform heights available. with maximum reach heights between 16-feet up to 56-feet. Additionally, we have one-man lifts and tow-behind lifts. All equipment that's guaranteed 100% functional. Purchase "work ready" equipment at a wholesale price. We do not charge any buyer fees, like some other companies in the industry. We arrange freight with zero mark-up. Our volume freight discount savings are passed directly onto our customers. Our clients are the key to our success. We work for you. Highly rated network of rental companies, distribution facilities, manufacturers and private owners. "The equipment exceeded my expectations! I am definitely going to refer you to my friends who need equipment." "I only have to look one place when I need equipment and that is ULE." "I have just received my fourth piece of equipment and each piece was a great value. I have saved thousands of dollars and received better equipment than from other previous sources that I had used." "I like the knowledgeable equipment specialists that review all my equipment options and specifications making sure my company receives the right piece of equipment to meet my job requirement’s."